Tezos, the blockchain project which once boasted the world’s most successful ICO and which has been mired in lawsuits for more than a year, has now been listed on South Korean cryptocurrency exchange Coinone. The price of Tezos jumped dramatically earlier today, which could possibly have been the result of the announcement. It currently has a market capitalisation of $965.7 million, according to coinmarketcap.com. This is a much-needed shot in the arm for Tezos, whose token in a general decline since being launched in July 2018. Why has it been in decline? Tezos began with promise but has had many problems. It is a blockchain network which can support smart contracts, in the same way as Ethereum. It was created by husband and wife pair Kathleen and Arthur Breitman of Boston and raised $232 million in its ICO in July 2017. At the time, this was the most money ever raised in this way. The proceeds were handed to a non-profit foundation in Switzerland that was set up for specifically for this purpose. However, the Breitmans soon found themselves in a bitter legal dispute with the head of the Tezos Foundation, Johann Gevers, while at the same time facing three separate class action lawsuits from investors who accused them of selling unregistered securities. They were initially not able to release money from the foundation to pay for the suits because of the former, but eventually Gevers resigned. The lawsuits are ongoing. After finally launching the project in June 2018, Tezos once again annoyed investors by telling them that they had to give their personal information to a third-party company, a requirement that was not mentioned when they gave the money in the first place. Perhaps as a way of regain them some legitimacy, the Breitmans announced in July 2018 that giant accounting corporation PricewaterhouseCoopers would be auditing the company. Coinone of Seoul is one of the biggest cryptocurrency exchanges in South Korea. 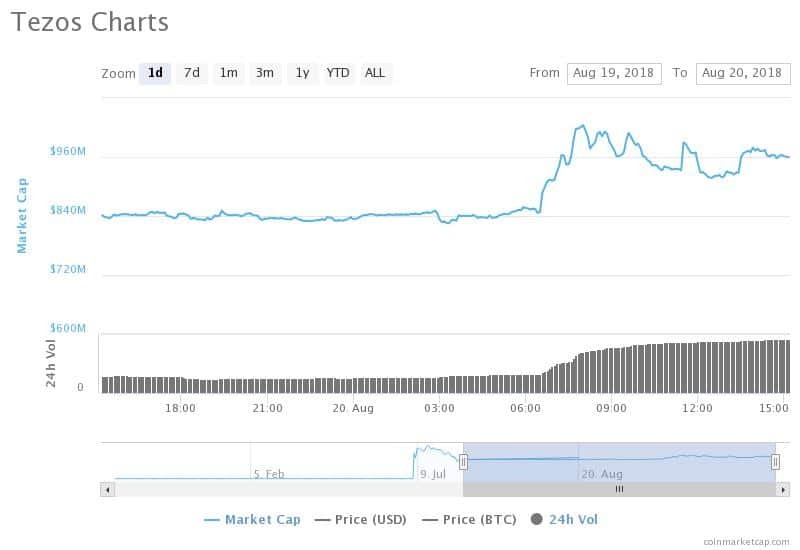 It has traded $22.8 million in the last 24 hours, according to coinmarketcap.com. In April 2018, it opened a branch in Indonesia and in May its payments arm, Coinone Transfer, began using Ripple’s xCurrent product. The listing is significant because it opens a new fiat currency up for Tezos trading. However, the news is not as significant as it would have been even a few months ago, when Coinone was processing more than $100 million worth of cryptocurrency trades every day. Volumes on South Korean cryptocurrency exchanges have fallen drastically since the country’s financial watchdog, the Financial Services Commission, began introducing new rules to govern them in June 2018. These include customer identification and tax obligations, as well as the Korea Financial Intelligence Unit being assigned to supervise customer activities. The millions of dollars’ worth of cryptocurrency stolen from the country’s biggest exchange in June didn’t help much either.